Kanye West + Aggressive Paparazzi = A Bad Day. Warning to over the paparazzi: Think twice! I know I've said some wacky stuff after a few too many drinks. Thank God none of it has been caught on tape. At least I hope it hasn't been. A camera was rolling when a buzzed Kanye West left The Wendy Williams Experience radio show and he had a lot to say. A lot. I watched that video clipped a few times and I put some of my favorite things he said in the above illustration. The good news is that he was happy tipsy guy. 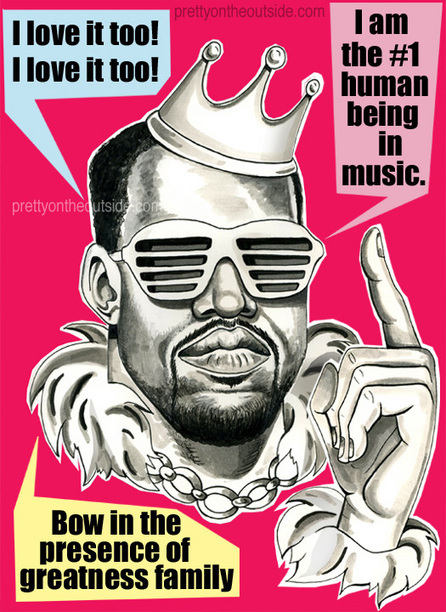 I give you King Kanye. All bow in the presence of greatness. Wanna see Kanye when he wasn't quite as happy? 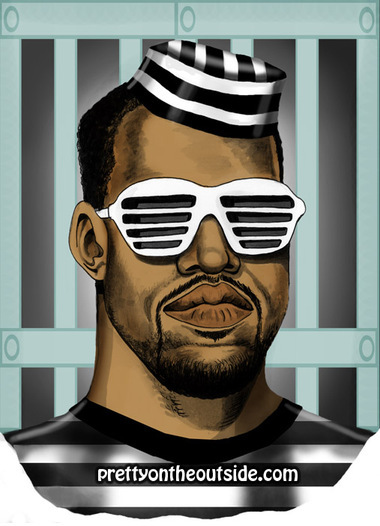 Listen to some of Kanye's music here. Ink and pencil on paper with photoshop text and background.